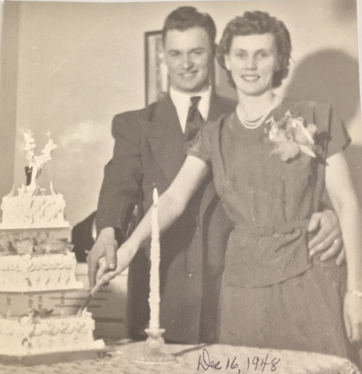 December 16 would have been George and Alice Hummel’s 70th anniversary. The southern Alberta couple married in 1948, and built their lives and raised their children in Champion, Alta. George farmed in the district for nearly 60 years and Alice, an accomplished musician from the Anderson Sisters Orchestra, taught piano lessons to more than 200 students throughout the area. Their home was filled with love, lots of laughter, and of course, music, but life hadn’t always been easy for the Hummels. Both George and Alice knew the face of hardship from an early age. George lost his father when he was barely a teenager, and as the oldest boy, he immediately left school to work and help support his family. Alice was about the same age when her parents had to forfeit their homestead during the Dirty Thirties. “Mom told us of the feeling of leaving so much behind, but also the hope they had that something better was ahead,” recalls one of their daughters, Ruth Hummel Thomson (MA ’10). “Our parents learned early, if you want something, you have to work for it. Their families got through some tough years by working hard, helping each other and supporting their communities. That’s what they expected from us too." Early mornings and late nights, the years for the Hummel family were filled with hard work, the kind that roots deep in your soul, farming, raising six children and working with neighbours for the betterment of their small town. And time, as it does, went by. With their children grown with lives and careers of their own, the couple moved to Lethbridge to enjoy their golden years. But retirement years aren’t without trials of their own. In 2003, George was diagnosed with Parkinson’s disease, which today affects more than 100,000 Canadians, with more than 25 people in Canada being diagnosed each day*. Although George’s great sense of humour never waned, the complex neurodegenerative disease took its toll. The couple were married for 61 years when George passed away in 2010 at the age of 83. Alice followed him six years later, when she was 93. From caring for their parents, to entering “Team George” (sometimes four generations strong) in annual Parkinson’s fundraising walks, the family pulled together. And now, they have come together again to honour their parents’ memory and create a lasting legacy that will impact future generations. Ruth, Eleanor and their brother, Bernie Hummel, have established the George and Alice Hummel Neuroscience Award at the University of Lethbridge. An endowed scholarship, a minimum $1,000 award will be given to at least one graduate student each year who is majoring in neuroscience and studying Parkinson’s or stroke. “We’re proud to fund this award to support students in their research studies,” says Eleanor, a graduate of the education program at the U of L.
By each of them contributing, the Hummel siblings were able to create something that will live on in perpetuity, and even though their parents’ interests were vast, deciding on how to direct the endowment was an easy decision. Ruth, who completed her Master of Arts at uLethbridge while working full-time in the Advancement Office, was especially connected. During her time at the University, she learned about the extraordinary brain research that takes place on campus at the Canadian Centre for Behavioural Neuroscience. From Dengue fever to Zika virus, a different virus pandemics makes headlines almost monthly. University of Lethbridge's Dr. Trushar Patel and his team are shining new light on viruses in an effort to inhibit their replication. As part of a unique youth sentencing initiative, uLethbridge faculty member Dr. Lance Grigg, a multidisciplinary team of researchers and graduate students, and a Provincial Court of Alberta judge are exploring how chess affects youths' thought-processes and decision-making.